Buljo Jikji Simche Yojeol (Vol. II); The Second Volume of “Anthology of Great Buddhist Priests’ Zen Teachings"
Hunminjeongeum (carrying the meaning of "Proper sounds to instruct the people" in Korean) is the former name for the present day Korean alphabet, hangeul, and it is a book that explains the principles and purpose of hangeul, as well as how to use and pronounce the letters. King Sejong, the 4th king of the Joseon Dynasty, created the Korean alphabet in order to help all commoners to easily read and write. 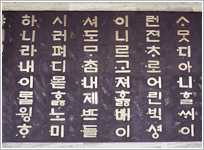 The task was promulgated in 1443 by the scholars of Jiphyeonjeon Hall (or "The Hall of Worthies") and in 1446, the alphabet was distributed and made known to all citizens.